There’s a little piece of equipment in most of our bathrooms. We walk past it all the time but to actually stand on it requires courage and the right head space. Yes, it’s the scale, but why do we avoid it? It’s because more often than not it just brings us disappointment. 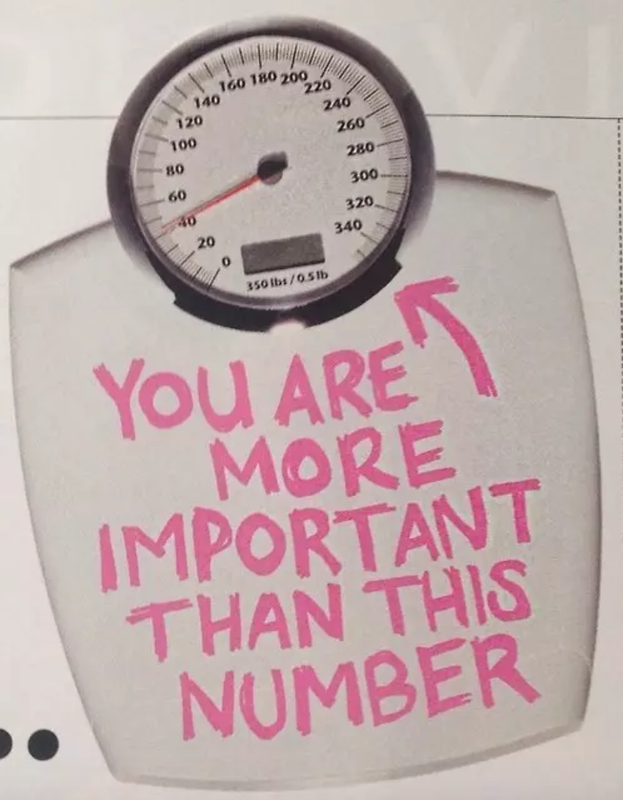 Whether you’ve been working hard to make it easier to squeeze into that dress you plan to wear on the weekend or just because you know it’s time to make a change, either way, after doing a little bit of exercise, results on the scale aren’t going to show, or worse still, you’ll see the number go up. Stop right there and take it back to that feeling you felt after you finished your killer workout. The muscle burns, the muscle aches and the feeling of achievement. You could feel yourself getting stronger, leaner and you just knew your body was thankful for it too. But as soon as you hopped on the scales your positive satisfaction suddenly disappeared to a discontented unhappy state. We’re all different, our bodies are made up differently and our weight changes everyday. Our weight is influenced by so many different factors that are too many to count, including stress. You could have spent the week eating right, working out heaps and the number may have decreased because of stress, or you may have spent the week eating right, working out heaps and the number increases because of stress. There’s nothing you can do about it, it’s just how we’re built and our bodies operate. We’ve all heard that old wife’s tale, “muscle weigh’s more than fat,” but according to Weight Watchers personal trainer, William Sukala, it’s a misconception that people say to soften the blow when we hop on the scales and it doesn’t skew in our favour. “Where the misunderstanding often comes in is that muscle is much more dense than fat, so that, by volume, it seems to weigh more,” he said. Personal trainer, Ashley Greenblatt helps illustrate this concept and explains whilst the weight is the same, it’s the composition that’s the difference. “Muscle has a leaner appearance due to its high density, whereas free-floating, Jello-like, fatty tissue needs more space to jiggle around, due to its low volume,” she said. Instagram star, Becky Lomas, has experienced this very issue and uses her health and fitness account helps to motivate her 168K followers. Inspiring fans to treat their minds and bodies well, she recently uploaded a photo to prove she knows exactly what she’s talking about. Uploading an image of a collage of her body and weight and its drastic changes from 2012, 2013 to 2015, she inspired fans to lose weight the healthy way. 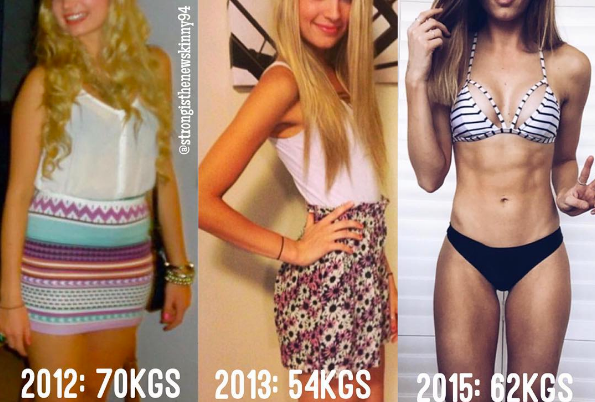 “The photo on the far left is me in 2012 – unhealthy, unhappy and needing to do something about my life,” she captioned the 70kg photo. With the photo that was taken a few weeks ago, you can see that even though she’s put on eight kilos since her 2013 photo, she’s healthy, happy and living a balanced lifestyle. A great way to measure your weight goals and triumphs is to simply judge how your clothes feel on. Are they looser? Are they tighter? Work from there to build healthy and realistic goals. You don’t necessarily have to throw out your scales, but don’t rely so much on them. Choose one day per month say the 1st at 9am and weigh yourself. If you feel you need to weigh yourself more regularly, try limit it to once a week at a certain time and day. Be proud of who you are and work hard to feel great and confident. You’ll be able to feel the difference even if it’s simply be running for the full 1km without stopping. Be proud of your achievements and progress and don’t let the number you see on the screen bring you down.